MARINA by DEA Linens custom embroidered sheets, pillowcases, shams, duvet covers and piquet coverlets. 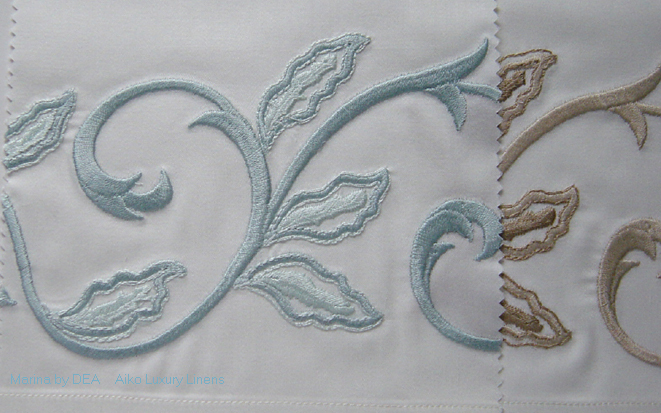 Click here to see more MARINA embroidery colors. Please contact Aiko Luxury Linens at for pricing of twin and full sizes, sateen fabric, embroidered MARINA piquet coverlets and shams. A 50% deposit is required with order, and the balance to be paid with shipment. Custom orders under $600 are charged in full. Marina Queen Flat Sheet 94"x114"
Marina King Flat Sheet 114"x114"
Marina Queen Duvet Cover 88"x92"
Marina King Duvet Cover 104"x92"